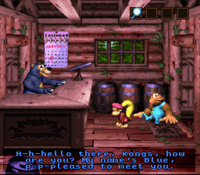 Blue's Beach Hut is the home of Blue in Donkey Kong Country 3: Dixie Kong's Double Trouble! It is located inside the entrance to Cotton-Top Cove. Originally, Blue's Beach Hut takes place in a cabin like the other Brothers Bear's locations. In the Game Boy Advance port, Blue's Beach Hut was redesigned, along with each Brothers Bear's residence. The whole interior is decorated with party favors, including balloons, cards, birthday cake, and presents. His place also received a bookshelf and fireplace. The liveliness of the redesigned area directly contrasts with his sadness. When Dixie Kong and Kiddy Kong visit Blue's Beach Hut, they discover that Blue is sad because the rest of the Brothers Bear failed to bring him a present for his birthday. However, if the Kongs manage to obtain Blizzard's Present from Blizzard's Basecamp, they can deliver it for him. The present will turn out to be a Bowling Ball, which Blue has no use for, and will let the Kongs keep it. Upon close inspection, the player can see a calendar in his beach hut, with the date of his alleged birthday marked, January 16th. This was removed from his redesigned location in the Game Boy Advance remake. This page was last edited on April 4, 2019, at 19:54.